Welcome to the home of the best Brazilian Propolis Extract from Beenefits®. We present you a Quality that is unique, proprietary, superior and delivers results as presented to you in factual pictures. This most medicinal natural compound may only deliver results that are directly proportionate to its quality. We present you Quality with results incomparable in the market. Quality matters. Good health is priceless. We care passionately. Therefore we always perfect the quality in order to serve you the best. Propolis is a jewel of nature. But propolis does not exist alone. It is selectively collected by the bees from variously available botanicals. Put by the bees in a perfect mix, expertly blended with precision, tirelessly perfected so the queen is served loyally and royally. The Literature on Propolis is as ancient as Hippocrates. This complex compound is collected not only from certain tree saps but also from select leaves. Meaning even when there are no trees in the area where the bees are, one will still find propolis where there is a beehive. That includes a dessert where the plants may be poisonous. Leave the bees alone and they will find a way to survive. Propolis, as was previously mentioned, is a resin collected by the honey bees in the last week of their life and the purpose for collecting propolis is simply to bring medicine back to the hive, to keep the hive disease free, to decontaminate and to sterilize and help the queen survive and be healthy. It is important to note the complexity of propolis because it requires mixing and putting together different compounds in different quantities from different botanical sources. My observations on the benefits are amazing, but science has put it in general terms and my observations do not only match but they even exceed what I have read in the best references on propolis. Science clearly states that it is antibacterial, anti-viral, anti-inflammatory, anti-oxidant. But it is important to notate that not all propolis is made equal. The chemical composition and therapeutic uses of propolis have been studied for years. Its ingredients vary greatly depending on its geographic and botanical origin. All types of propolis are rich in antioxidants and have powerful healing effects. This compound can be used as a local anesthetic, a food preservative, or an antibacterial agent. The active ingredients in propolis help prevent diabetes, reduce inflammation, and support cardiovascular health. Propolis extract is one of the best natural sources of flavonoids, phenolic acids and esters, essential fatty acids, volatile oils, and free amino acids. It also contains trace elements, including iron and zinc. Studies have found that propolis is high in vitamin B3, quinones, and protein. This product has a high biological value and contains active ingredients that promote optimal health. Propolis is packed with flavonoids and phenols. It contains over 185 complex compounds. Propolis is found in green and in red and brown. I have worked with many different types of propolis and I have found that the best qualities come from remote regions of the world especially the Amazon basin. Propolis is gluey and sticky so if you find that the propolis you have purchased does not have that kind of physical feel then you may want to question its quality. One of the easiest ways to test it is to drop about 10 drops of propolis on a napkin and observe the color transformation and concentration of the spot onto which you dropped the propolis. One may ask why Brazilian Propolis Extract versus others. The fact is that the Amazon region of Brazil is so complex. In one square mile of the remote region, one may find hundreds if not thousands of wild species of all types of botanical plants including poisonous plants which provide what I think is the best quality of Brazilian propolis extract. The remote, primitive regions of Brazil are wild, virgin, untrodden, rich, complex, unmanned, ancient and ever self-rejuvenating. 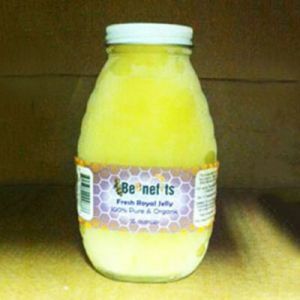 I invented The brand Beenefits® out of deep belief and out of personal observations, it took me six years to perfect the process. But despite an excellent process that is unique, every time I experimented with a different quality I got different results until I settled on the best. Brazilian Propolis Extract. It is important to note that quality matters. There are hundreds of brands in the market. Quality wise there are only a few. First, the glycolic extract which is also sold as the alcohol-free extract is not anywhere near an extract. It is actually Glycol, which is a solvent, and imitation propolis. This is what immitation propolis looks like. Sorry, we refuse to sell such a quality. The Chinese call above quality simulated propolis. You can buy this quality for about $20 per pound. It is void of propolis, but full of artificial flavor, color, black poplar wood. You can melt this in alcohol in a matter of minutes. It is full of industrial glue. This same quality can dissolve in Glycol in no time presenting a product that looks like propolis, almost smells like propolis, but in view void of benefits. Fortunately there is a lot of research on the subject, but unfortunately, the average consumer does not know the difference between good and bad research. I believe that a company in this industry should exercise self-discipline, and should have high regards for the health interest and concerns of the consumer. I think that the consumer is being insulted every day by the cheap offerings available in the market. 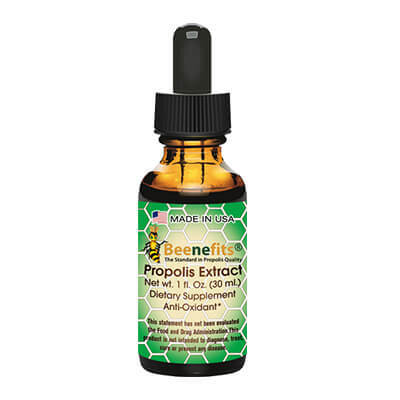 Brazilian Propolis Extract offered by Beenefits® is a champion of quality. The results prove that. Look at the pictures and you should be able to at least think that, wow, this is real. Why is it that no the supplier provide such evidence of superiority.